Are you interested in: History, Museums, Museum Education, Curation, Natural Science, Planetariums, Anthropology, Exhibition Design, or Parks and Recreation and Tourism? 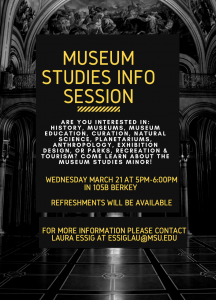 Come learn about the Museum Studies Minor. Join us for a workshop on replication research! Dr. Graeme Porte from the University of Granada will lead us through a workshop on why replication research is important, and more importantly, how to do it well. Dr. Elizabeth Sanders introduced many of the tools and methods being used today to drive and/ or inspire design from a human-centered perspective. Sanders teaches Design at The Ohio State University and is the founder of MakeTools. Recently she co-authored Convivial Toolbox: Generative Research for the Front End Design. 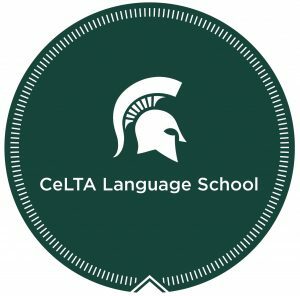 CeLTA Student Interaction Grants provide support in reaching oral proficiency goals over the summer months. Students in Arabic, French, German, Italian, Portuguese, or Spanish classes 202 or above are eligible. This is an excellent opportunity to advance your speaking skills and to get guided feedback on your speaking proficiency. Because these activities can be done using video conferencing, you do not need to be physically present on campus; a webcam and a good Internet connection are required. If all of the criteria are met, there will be an opportunity to receive 5 more free conversations. Applications are due April 5, 2018 at 5 pm. 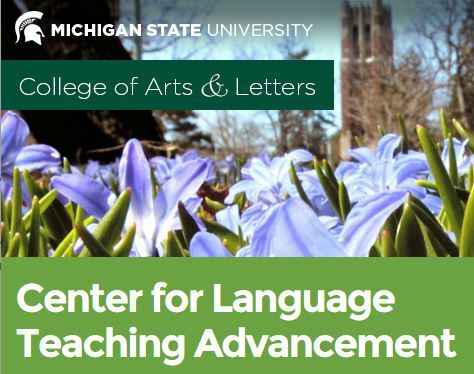 If you have questions, please contact Daniel Trego at tregodan@msu.edu. 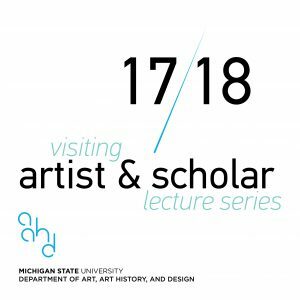 Dr. Joanne Turney is a Design Historian specializing in textiles and fashion as material culture. Turney teaches at the University of Southhampton, Winchester School of Art in the UK. Her book, The Culture of Knitting, is seminal knitwear research and is the framework for understanding the complicated position of knitwear in contemporary culture. MSU students in Museum Studies and the Art History Student Association have been working since November to prepare the first exhibition in the new Broad Art Lab across the street from the Broad Art Museum. Twelve students helped to chose pieces from the museum’s collection, wrote labels and worked on the installation. Their efforts are coordinated by Art History faculty members Susan J. Bandes (also Museum Studies) and Jon Frey and a team from the Broad Art Museum. The is a wonderful opportunity for the community to become acquainted/reacquainted with significant museum holdings and is the first of the collection exhibitions that are envisioned for this new space. 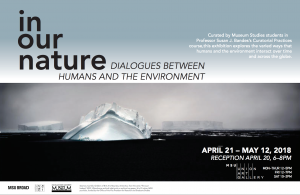 Students in Susan J. Bandes’ Curatorial Practices course at Michigan State University will be presenting In Our Nature: Dialogues Between Humans. This exhibition is collaboratively curated by the students and runs April 20, 2018 – May 12, 2018. 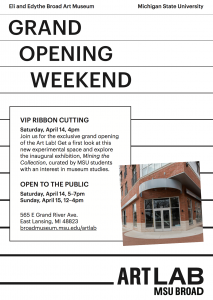 The opening reception will be Friday, April 20, 2018 from 6:00 – 8:00 pm in the Second Floor Union Gallery on the MSU Campus. 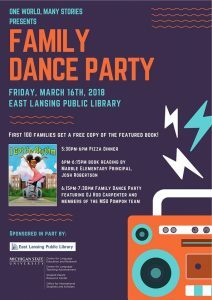 Opening remarks will be at 6:30 pm. The Union Gallery is open Monday‐Thursday, noon‐5 p.m; Friday, noon‐ 7 p.m.; Saturday, 10 a.m.‐2 p.m. 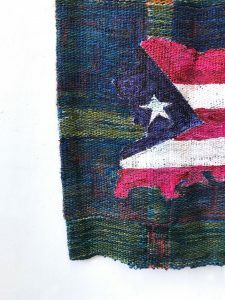 The exhibition features art and artifacts from the Broad Art Museum and the MSU Museum collections dating from the late 19th century to present day and from a variety of cultures. They are used to explore the varied ways that art and artifacts tell stories of the human impact on the environment over time and across the globe. In celebratory and reflective examples, the evolving relationships will be explored. Images may reflect the sacred or the secular, the mundane or the extraordinary.